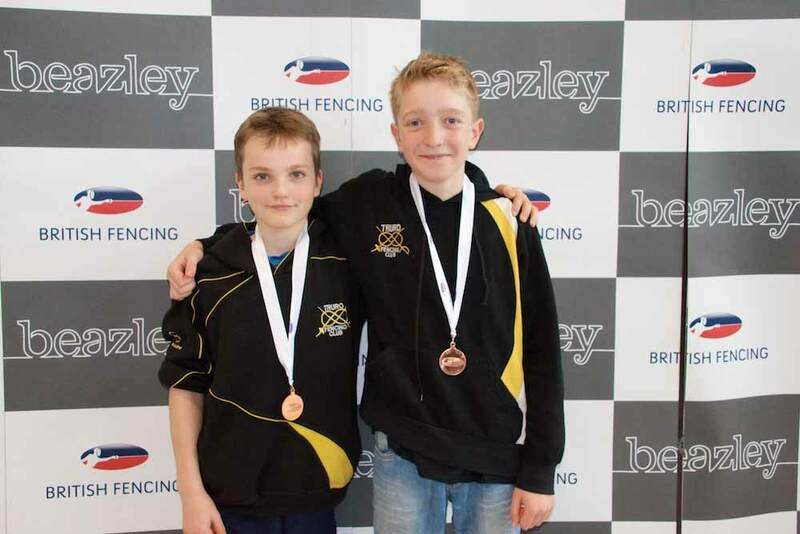 Over the May bank holiday weekend our fencers were competing in Sheffield at the British Youth Championship Finals, after qualifying through the regional rounds earlier in the season. Our fencers have worked hard all season and, with a depleted team due to GCSE and A level exams, the baton was handed to our younger fencers and they did not disappoint, claiming two national titles and two bronze medals! In the Under 12 Boys’ sabre, Wiktor Kujawski finished in 10th with Luke Barnsley in 6th. Max Cromie faced some tough refereeing decisions at key times in his quarter final draw and was narrowly defeated 9-10, finishing in 5th place. 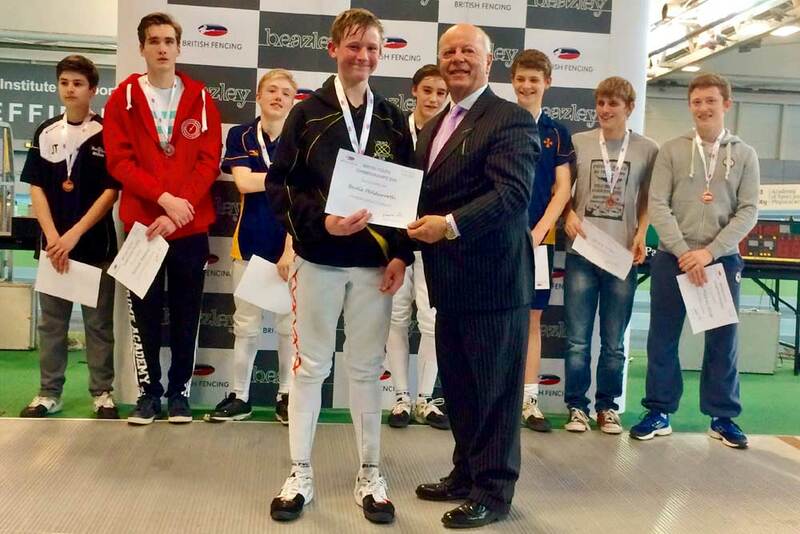 In the Under 14 Boys’ sabre Henry Hurst finished in 13th with Sam Boorne claiming the bronze. An impressive display of fencing from Luke Haynes saw him take his place on top of the podium! In the Under 14 Girls’ sabre event Keely Rodda finished in 5th with an impressive day’s fencing from Molly Wood who took the bronze. Eoghan Cromie was fencing in the Under 16 Boy’s foil event. There were over 60 competitors in the Under 16 foil, with the best fencers having already qualified from around ten regions across the UK. Eoghan fought hard through the poule fights and knockout rounds to win a 7th place final position, automatically qualifying him for next year’s event. Our lone entrant in the Under 16 Girls’ sabre event was Lily Wood who fenced well all day but was defeated by a stronger opponent in the last 16, finishing her day in 10th place. 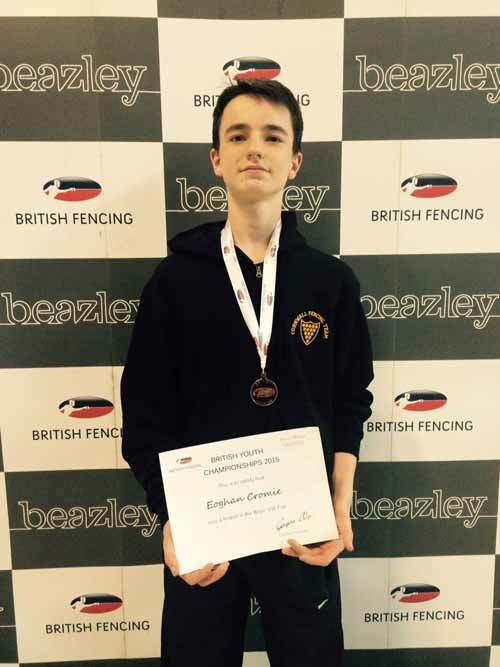 Bertie Holdsworth continued his consistent reign of success in these championships by claiming the national title for another year in the Under 16 Boys’ sabre event, an impressive feat with still a year in this age category. Eoghan Cromie pictured after finishing 7th. Max Cromie and Luke Barnsley pictured after finishing 5th and 6th respectively.